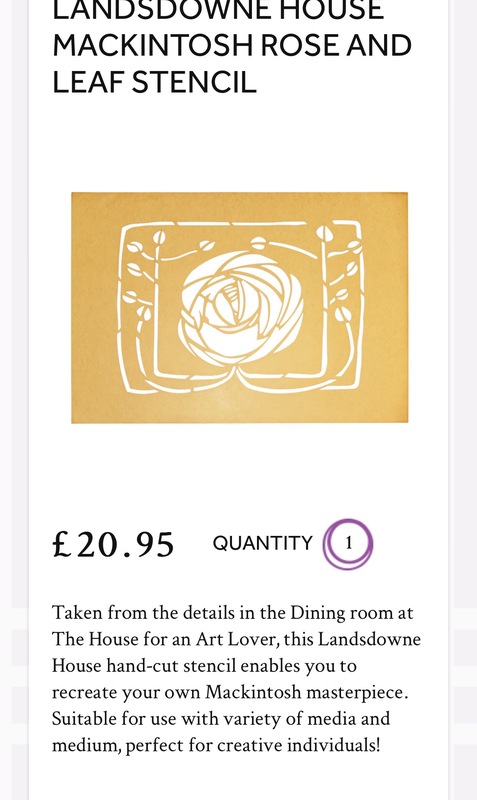 Recently I delivered some of my hand cut stencils to The House for an Art Lover’s shop. This is a great property built in the 1990’s after Mackintosh’s design from the turn of the century. Located in the Belahouston Park in Glasgow South Side it has a good number of rooms recreated from the original drawings by a team of crafts people and artists. I was commissioned to recreate the stencilling and out of the designs I used I have designed some stencils which are hand cut and offered to “stencillers to be” to help them recreating their own Mackintosh interior. If you can visit the property its a great experience… but if you can’t you can now purchase them online from The House for an Art Lover’s online shop They come will full instructions and if you are still unsure of what to do… you can always join one of my courses I will be delighted to show you the art of stencilling… the next one is with The Charles Rennie Mackintosh Society on the 16th of June.